NICHOLAS ESTATE AGENTS & NEA LETTINGS: Set within this sought after area of Caversham is this light and airy semi-detached house. The property has been extended and boasts two reception rooms. separate kitchen and conservatory on the ground floor. On the first floor there are three bedrooms and a bathroom. To the rear, there is a good sized garden that has a garage, shed and a large greenhouse. There is a paved patio area ideal for those summer BBQs. Call now to view. Dining Room - 3.78m x 2.69m (12'5 x 8'10) - A good sized room with a double glazed window to the side, door to the kitchen, storage cupboard and carpeted. Kitchen - 3.20m x 2.11m (10'6 x 6'11) - A modern light and airy kitchen with wall and base units. Rool top work surfaces with inset sink and drainer. Recess for the oven and hob, recess for washing machine and recess for the fridge freezer. Window overlooking the garden and door to the garden. Conservatory - Accessed from the living room, views over the garden and door to the garden. Bedroom One - 3.40m (into bay) x 2.79m (11'2 (into bay) x 9'2) - A light and airy room with a double glazed bay window to the front, carpeted, fitted wardrobe and carpeted. 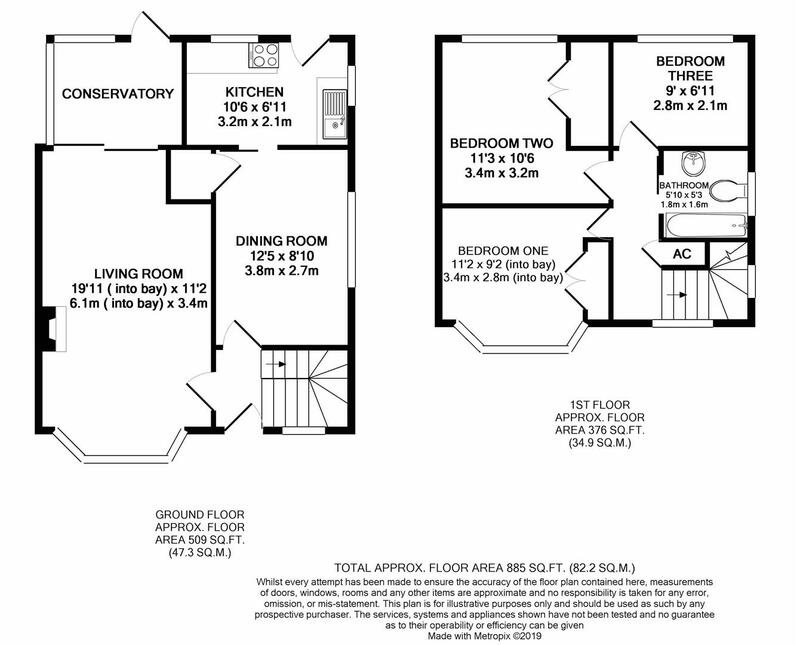 Bedroom Two - 3.43m x 3.20m (11'3 x 10'6) - Offering views over the rear garden is this good sized room with ample fitted wardrobes, carpeted and a double glazed window. Bedroom Three - A bright room with a double glazed window overlooking the garden and carpeted. Garden - A good sized garden that is partly paved with a garage and shed. To the rear, there is an area with a good sized greenhouse and area for the vegetable garden. Bathroom - Comprising of a panelled bath with mixer tap and shower attachment, WC, wash hand basin and a frosted double glazed window.